I'm actually ok with the fact that I'm a fiasco in the kitchen. I'm better at writing ABOUT food, versus cooking it. It doesn't keep me from trying, but when I find myself in the room in my home that is cut out for making delicious meals, I end up creating an inedible "Franken-food" concoction that the dogs won't even eat. To be truthful, I've actually auditioned to be on shows that might help me with my miserable misfires, but so far, I've made a callback or two, but haven't been selected. Maybe the networks think I'm just beyond help. And guess what? I can't blame them. Celebrity chefs would not be prepared for my knife wielding techniques. I'm convinced that if I would attempt to chop anything with a carving knife in front of an audience, I might be arrested for inadvertent manslaughter. Fire alarms have been disabled in our condo and neighbors have begged me to steer clear of the kitchen. There are smiles on the doormen as they see the delivery guy bring dinner to the apartment, since it means an evening of quiet rest without jumping up to get the fire extinguisher (yet again). So yes, I blog about food. And just so you know: My dating profile said that I was into healthy food and living - no lie! That my (now) husband interpreted that into thinking that I could somehow make food taste good in a kitchen is *NOT* my fault. He was the one cooking ME dinners and being a show off at the stove, so there was no arguing there. I think five years later he's still wondering what the Hell happened... and he makes sure to remind me of my dishonest dating approach every once in awhile. 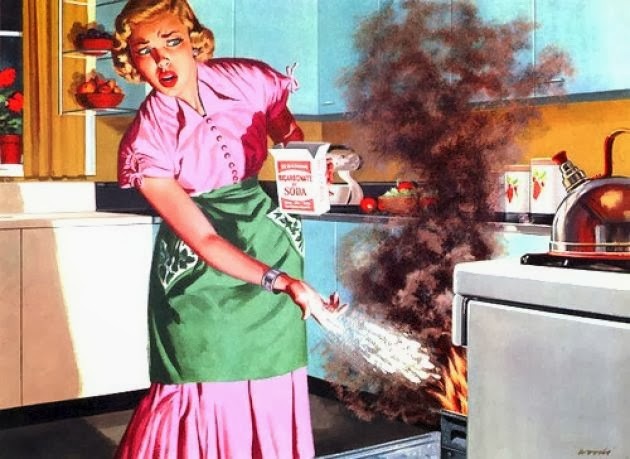 Of course, now that I have a young son (a toddler, age 2), I should try to learn how to be more like Betty Crocker and less like Lizzie Borden... but until a cooking school for the culinary disabled comes along, I'm stuck with who I am. I'm NYC Foodie Girl. I write about food and share recipes (THAT OTHERS contribute). I don't cook. Just because I can't prepare a dish, doesn't mean I cannot enjoy it or be very impressed when I hear how something was put together. Bloggers can write travel blogs without knowing how to fly a plane or steer an ocean cruise liner. It's the same principle! So Martha Stewart, when you question the integrity of bloggers as a whole -especially food bloggers, I could care less about your test kitchens and how a story is crafted in a round table discussion with editors. I share my experiences in truth and with raw facts that don't go in a glossy magazine or on a corporate-owned website that has a 'pseudo blog' just to increase readership. Everyday bloggers are here to stay because we offer a real voice of authenticity that media moguls struggle with on a corporate scale. Put that in your cakepan and bake it! You're so funny. So, we are going to be going through NYC in the next couple days. What would be a good foodie experience for people who like good mom and pops? Maybe even a good food cart?